I grew up with two creative parents who were always up to something with new hobbies. I didn't realize the bug had hit me until I bought myself a silly $100 sewing machine and starting sewing little things for during my first pregnancy. There were a million DIY baby projects out there--from blankets to burp clothes--and I just had a try a few myself. 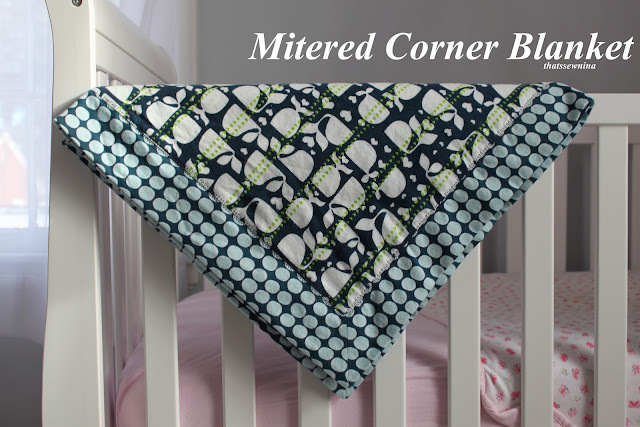 First up… the Mitered Corner Blanket. Ooh—I love this project. I received one of these from my mom at my baby shower for Miss M. It’s two layers of coordinating flannel fabric. With bright, bold fabrics, it’s so beautiful and has a great purpose too! For newborns, it’s a square blanket of a good size so it’s perfect for swaddling. When little one (LO) gets older, it’s a great size for a toddler “blankey”. Flannel is durable, soft and doesn’t stain easily. Miss M has sent hers through the ringer and it’s still holding strong. BONUS—while striking and beautiful and sure to be a show-stopper at your baby shower, it’s also a 90 minute or less project. My inspiration? This idea didn’t come out of thin air. Here are a couple of other tutorials I used when first making this project: USU Extension and donswife blog. Cut your two pieces of fabric into squares so that one is 10 inches larger than the other. Say, 40" x 40" and 30" x 30". The manufactured width of your fabric is probably between 40-42" so that will likely decide your maximum size. You will need to center the smaller square sides with the larger square sides. This will create perfect border all around. Now I have to admit here that I hate pinning my fabric… so here’s how I do it. Choose your first side to meet together and fold in half. Put a pin at the center of the smaller fabric. Now repeat with the larger fabric. With RIGHT SIDES TOGETHER pin the two fabrics together where you marked the centers. Match up the edge (flannel is nice because it will stick together without needing to do extra pinning). Of course, you’ll find the larger fabric will be five inches longer on the top and bottom of each side. two center pins meet. pin fabrics together here. Starting 1/4" in (again right sides together), sew the edges together with a 1/4" seam. End 1/4" inch from the end. You leave the ¼” on each side to make room to sew at each corner. Don't worry if there are some minor gaps. Your finishing seam will close everything up. Repeat for the two more sides. Pin the centers together. Match the edges. Sew the edge leaving ¼” at each end. Repeat the same process for centering and placing your fabric on the fourth and final side. Instead of sewing all the way down the seam, you will need to create a gap in the seam where you will turn the blanket right sides out. The gap will be easily hidden when you complete the finishing seam so give yourself plenty of room here. I usually leave a 4-5" gap. Double-pin 2-3" away from your center pin on either side as a reminder to yourself to stop when you're sewing. Backstitch a few stitches when you reach your double-pins. Once you have your four sides sewn together, you’ll see the border has formed and you have a good idea of what the blanket will look like (inside out). Now you've got to deal with the "floppy corners" and make them into the perfect mitered corner! Now I’ve looked at A LOT of tutorials on making this blanket. The corners seem to be the most confusing part so I hope I don’t add to the confusion and instead simplify it. Here’s what you do… Fold your corners edge-to-edge diagonally (like you're forming a triangle with the blanket). Hold the long edge vertically. If you have a ruler mat, it’s handy to place it along a straight line. Place a ruler or straight edge from the end point of your seam to the folded edge to create a 90-degree angle. If you have a marking pen, draw a line along your straight edge. Pin along the line and sew your seam along this line for each corner. Once you’ve sewn your corner seam, trim the excess fabric from the corner. Before you trim you can flatten your blanket out and check to make sure the corners look right. Iron the corners seams open and the inner square edges toward the inner square. Reach in through the gap you created along the one side. Grab each corner and pull your blanket right side out. Be sure to really poke at the corner so you get a nice square corner. Work at your blanket to make sure your borders are even. (The more your pull at your corners, this should happen pretty naturally.) Find the gap and press the seam so that it fits in with the rest of your seams. Take the time to press the outside edges of your blanket. This will make it easy to sew your finishing stitch on the interior border and will keep the borders nice time after time when washing. Trim your threads and you're done! **If you don't know this trick, I feel it is my responsibility to share... when you approach the corner between two sides, DO NOT end your seam and take your project off of the machine. Instead, carefully approach the corner with the needle and stop right at the corner and lower your needle into the fabric. Lift up your pressure foot and turn your fabric 90-degrees and begin sewing down the next edge. This way you can sew the entire border without having to stop. Be sure to overlap just a few stitches to secure your seam. If you already knew this, your momma taught you well.